I have been blessed with two children who are fabulous sleepers. When they were 1 week old, they started sleeping 6 hours straight and by 1 month they were sleeping 8-12 hours at night. My kids are flexible with their sleep too– they can take a late nap and still sleep that night. They can stay up later than usual without having meltdowns and they love to sleep in. We don’t stick to a strict bed time or wakeup time, it varies depending on where we are and what we are doing. When I tell other parents this, I’m often given the stink eye. I never had to go through the sleep deprived nights of the early infant days. I know, I am lucky. However having children who love to sleep has one, major drawback– mornings. Mornings with “sleeper-iners” can be rough. I usually wake them up 30 minutes before they have to get out of bed, so that they have time to slowly wake up. Getting them to climb out of their warm, cozy beds is still a challenge, even with the advance warning, and mornings around my house are often a rush to get teeth and hair brushed, breakfast in bellies, shoes on the feet and out the door to school! As a result, weekday breakfasts around the Hello Creative Family house are usually a simple affair. We eat a lot of yogurt with fruit, yogurt with granola, homemade instant oatmeal packs, cereal and my favorite– chia pudding. Friends, what would you say if I told you that I had a breakfast idea that TRULY takes less than 30 seconds to prep? It honestly is faster than pouring a bowl of cereal with milk! You can make it the night before and wake up with a delicious breakfast that can be served in the container you made it in. AND I GUARANTEE you will have PERFECT results every time! Are you game? The secret behind my 30 second easy chia pudding recipe is in the liquid that I use to make it with– HANS Dairy Smoothies! It makes perfect chia pudding EVERY SINGLE TIME!!! I love that HANS Dairy is owned by two sisters in Ontario (yay female entrepreneurs!!!) They are passionate about bringing natural ingredients to the market and ensure that their products are free of any artificial flavourings, colourings and preservatives. Their smoothies are made with yogurt and come in Mango, Strawberry, Passionfruit, Blueberry and Peach flavors which gives you a ton of options when it comes to making chia pudding! You can even mix two flavors together for extra yumminess! 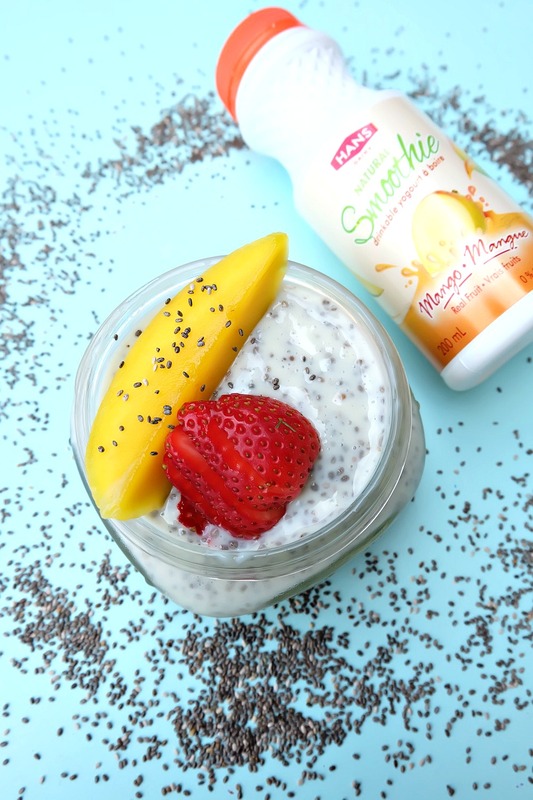 Mango strawberry chia pudding anyone? Another thing that I love about the owners of HANS Dairy is their commitment to continuing their parent’s legacy of creating South Asian dairy products in Canada. Immigrants to Canada, Mr. and Mrs. Hans weren’t able to find many of the dairy products that they had grown to love from the little village in India where they were raised. Their daughters have continued their tradition of having a strong Indian influenced product line with Lassi, a yogurt drink; Kheer, a rice pudding; and Makhan, a whipped butter. As you know if you spend much time at Hello Creative Family, I strongly believe that creative parents raise creative kids, so I love hearing stories of parents passing their creative passions along to their children! 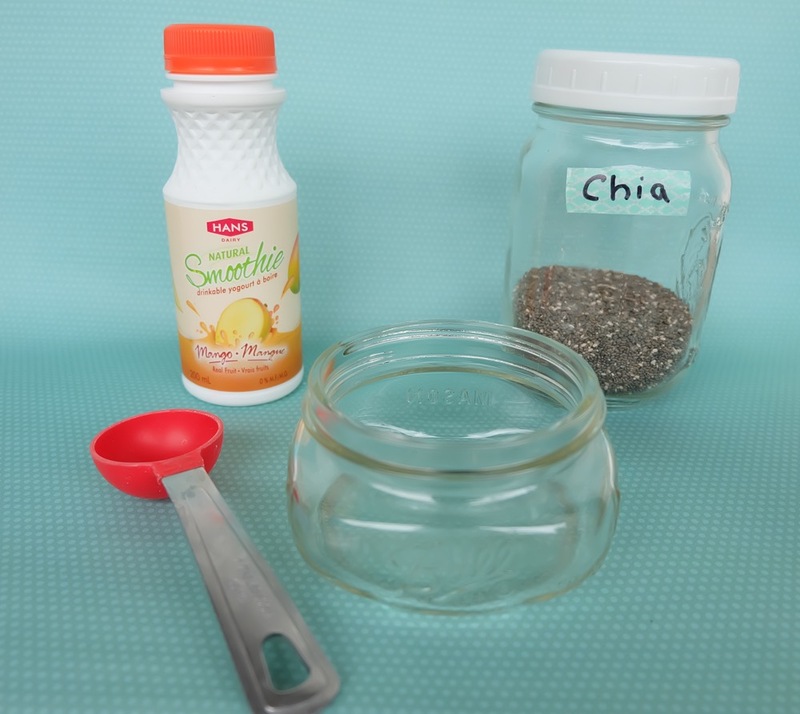 Speaking of sharing creative passions with your kids, get your kids to help in the kitchen making this easy chia pudding recipe! It’s so easy that if you show them once, they can make their breakfast the night before every night! 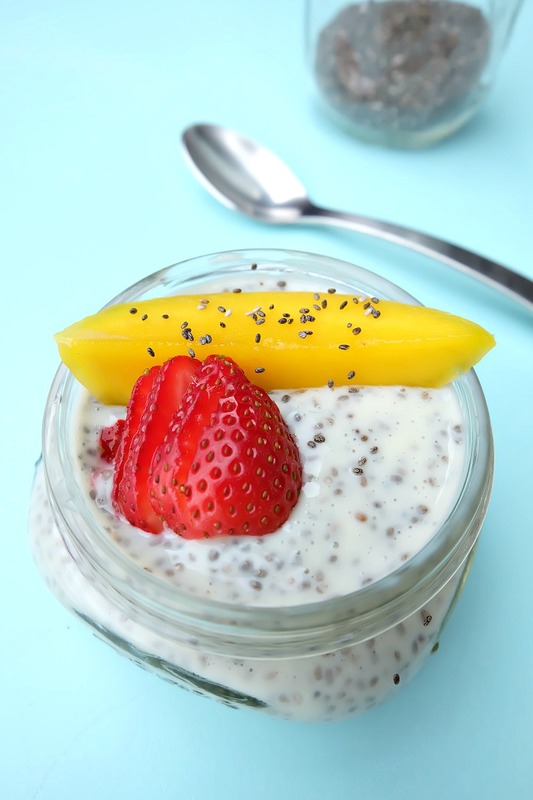 You’ll feel good about sending your kids off to school with this chia pudding in their stomach. Between the yogurt smoothie and the chia seeds it has 12 grams of protein, which will help keep your kiddos satiated throughout the morning. 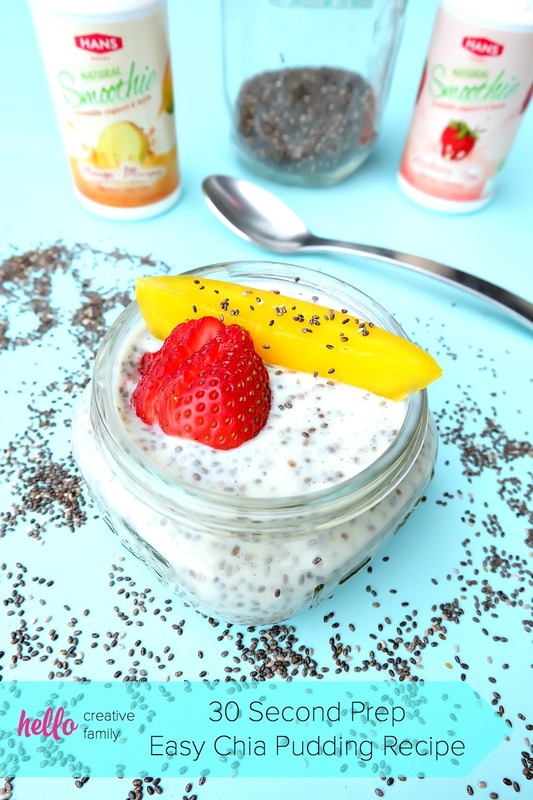 Read on for my 30 Second Prep Easy Chia Pudding Recipe and for your chance to win an awesome prize pack from HANS Dairy! -Optional- Fresh fruit to add to your chia pudding prior to eating. 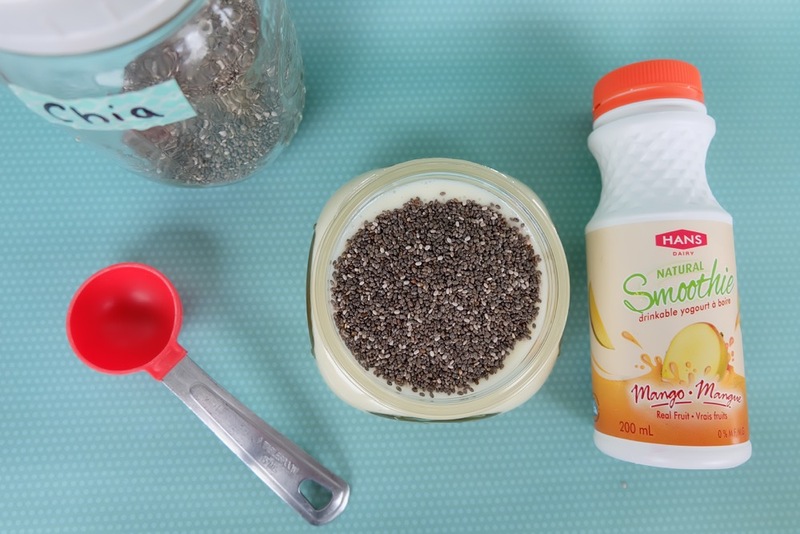 Step 1: In a mason jar combine smoothie with 2 tablespoons of chia seeds. Put the lid on the mason jar and give it a shake, shake, shake. Leave covered and put in your fridge for one hour to overnight. Step 2: Take out of the fridge and serve! Mix your chia pudding with fresh fruit for extra yumminess! See? It really is easy peasy lemon squeezy! The lovely ladies at HANS Dairy want to give you the chance to try their delicious products for free! Enter below for your chance to win! 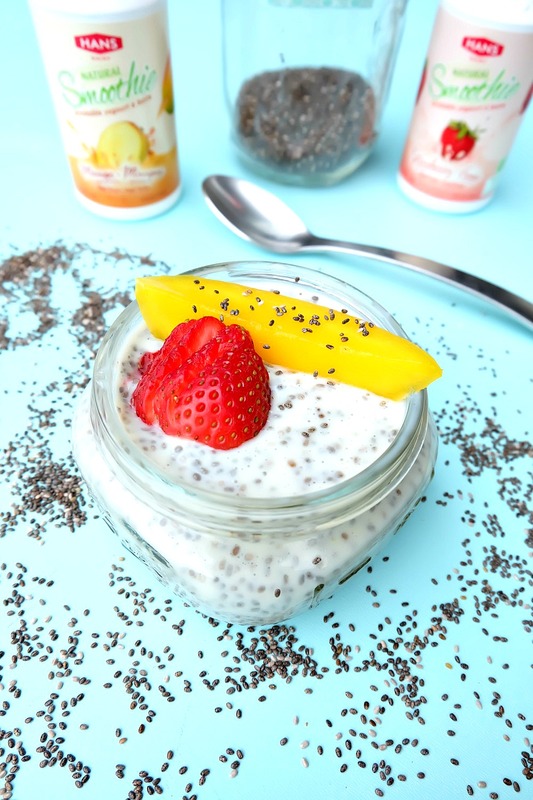 Tell me… Have you ever made or eaten chia pudding? 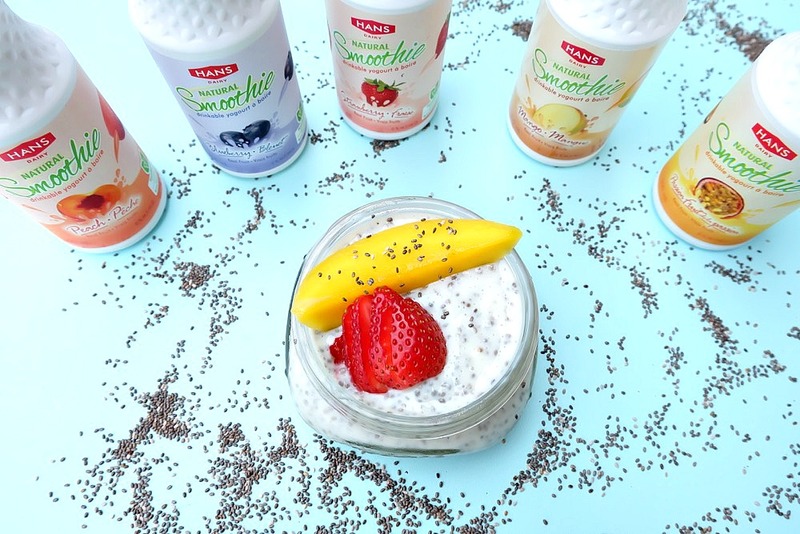 What flavor of HANS Dairy Smoothie would you use for your chia pudding? Disclosure: Thank you to Hans Dairy and YMC for working with us on this post. As with every article on Hello Creative Family, all thoughts and opinions are 100% our own! Chia pudding is definitely one of my favourite grab and go breakfasts for those busy mornings. I also like to take them to work with me for lunch if I have nothing else left in my fridge! Annie I. recently posted…These 20 Things Belong in Your Kitchen: Get them Now! I always felt like Chia Seed Puddings wouldn’t come out right if I tried it. I’ll definitely try the smoothies. Chai is cool, made this before. Looks like a recipe I should try.